Optimal blood pressure control is associated with an average 50% decrease in incident HF and thus underlying the importance of BP-lowering strategies to prevent HF. Non-pharmacological interventions are recognized as the cornerstone of hypertension prevention and an important adjunctive strategy in individuals already diagnosed with hypertension. Numerous interventions were tested for the efficacy on BP control, but very limited data is yet available to confirm a benefit on the clinical course of hypertension and related complications including risk of heart failure. 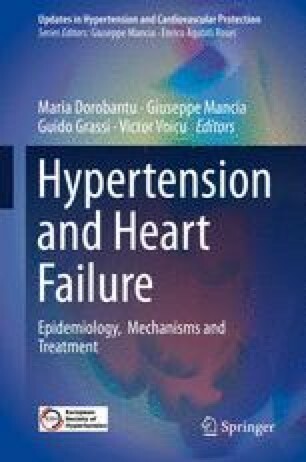 In the light of current evidence, DASH (Dietary Approaches to Stop Hypertension) pattern, sodium reduction, and physical activity seem to provide the most significant benefits for reduction of heart failure. Other interventions with good level of evidence for lowering BP and recommended by clinical guidelines are weight loss in patients who are overweight or obese, potassium supplementation, and moderation of alcohol consumption. Semlitsch T, Jeitler K, Berghold A, et al. Long-term effects of weight-reducing diets in people with hypertension. Cochrane Database Syst Rev. 2016;(3):CD008274. https://doi.org/10.1002/14651858.CD008274.pub3. Siebenhofer A, Jeitler K, Horvath K, et al. Long-term effects of weight-reducing drugs in people with hypertension. Cochrane Database Syst Rev. 2016;(3):CD007654. https://doi.org/10.1002/14651858.CD007654.pub4. Colquitt JL, Pickett K, Loveman E, Frampton GK. Surgery for weight loss in adults. Cochrane Database Syst Rev. 2014;(8):CD003641. https://doi.org/10.1002/14651858.CD003641.pub4. U.S. Department of Health and Human Services and U.S. Department of Agriculture, U.S. Department of Health and Human Services and U.S. Department of Agriculture. 2015–2020. Dietary guidelines for Americans, 2015–2020. 8th ed. 2015. https://doi.org/10.1016/S0300-7073(05)71075-6. Stead L, Buitrago D, Preciado N, et al. Physician advice for smoking cessation. Cochrane Database Syst Rev. 2013;(5):CD000165. https://doi.org/10.1002/14651858.CD000165.pub4. Civljak M, Stead L, Hartmann-Boyce J, et al. Internet-based interventions for smoking cessation. Cochrane Database Syst Rev. 2013;(7):CD007078. https://doi.org/10.1002/14651858.CD007078.pub4. Cormick G, Ciapponi A, Cafferata ML, Belizán JM. Calcium supplementation for prevention of primary hypertension (review). Cochrane Database Syst Rev. 2015;(6):CD010037. https://doi.org/10.1002/14651858.CD010037.pub2.www.cochranelibrary.com.